Happy Wine Wednesday! It’s not too early to talk about fall, right? It is less than a week away. I love, love, love the fall. Why? So many reasons. The cooler weather and the crispness in the air, the weather that gives you an excuse to bundle up but isn’t too cold. The spirit of football season and dressing up to watch the games. The smell of freshly-fallen rain. And finally, the RED wine! Enough of the Rieslings and roses. It’s time for some deep, peppery reds. 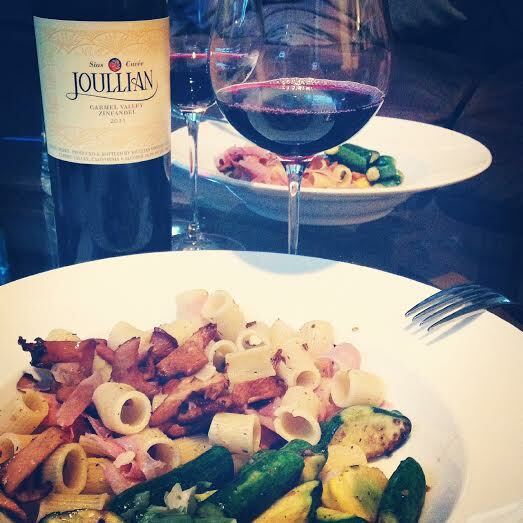 The weather on Megan’s Island cooled down a bit, long enough for us to open the bottle we got in the Carmel Valley — the award-winning Joullian 2011 Zinfandel. It did not disappoint and was just as good as we remembered. A very happy wine Wednesday, indeed! What did we pair with the wine? It’s chanterelle season and we sauteed them with thyme and unsalted butter (about 1/2 a stick over 30 minutes of cooking) and added some half rigatoni noodles. We also sauteed baby zucchinis with olive oil, minced garlic, salt and pepper. Combined the meal was delicious. We recently received an email from Joullian and our first shipment of wine club wines is set to ship on October 13 — the day after my birthday — and will include their 2011 Estate Cabernet Sauvignon, 2011 Family Reserve Syrah, and 2012 Estate Sias Cuvee Zin (the next vintage of this wine). We’re so excited we joined the club! CHEERS!